What In The World is DETCOG? Well, I'm glad you asked! DETCOG stands for the Deep East Texas Council of Governments, an organization made up of representatives of the twelve counties in deep East Texas, of which Houston County is one of them. DETCOG meets once a month, in each of the respective counties in the COG. Walter Diggles is the Executive Director of DETCOG. Walter does an excellent job, overseeing an incredible number of projects ranging from issues involving aging, at risk youth, youth projects, housing, disaster recovery, the list goes on and on. Every county in Texas is part of a Council of Governments, but in my opinion, there is none better than the DETCOG. The COG is responsible for facilitating federal money such as disaster recovery funds. It's a conduit for money that assist cities like Crockett with water and sewer projects, as well as other important items. Representatives from each community and county in the DETCOG make up the membership. We are fortunate to have our County Judge Lonnie Hunt as the First Vice President of the DETCOG Board. 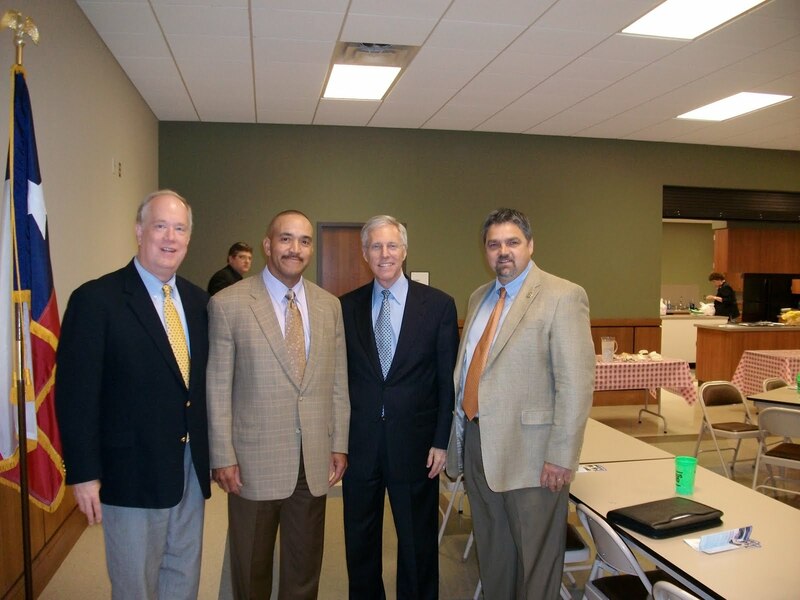 Over the years, Houston County and more specifically Crockett, has benefited from it's involvement in the COG. In the very near future, the City of Crockett will break ground on a Civic Center addition project that will create over 3000 square feet for us to use primarily as a storm shelter. Until the time comes when we need it for that, we will have additional floor space to use as break out rooms or meeting rooms. This project is funded through federal disaster assistance money, facilitated by the DETCOG. I appreciate all those that have unselfishly served as members of the DETCOG over the years. I myself have served as the Crockett representative to the DETCOG for almost a year and from what I can tell, we are certainly much better because of the efforts of those associated with the Deep East Texas Council of Governments. The picture is from a recent DETCOG meeting in Nacogdoches. With Houston County Judge Lonnie Hunt, Houston County Commissioner Willie Kitchen and myself, is former Congressman Jim Turner. You have to love East Texas weather. 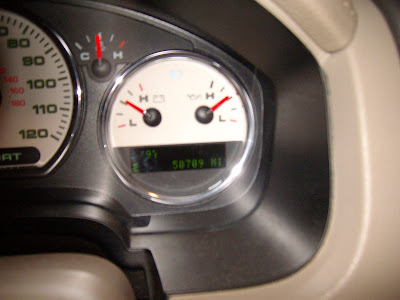 Here is an example of just how much the temperature can change. 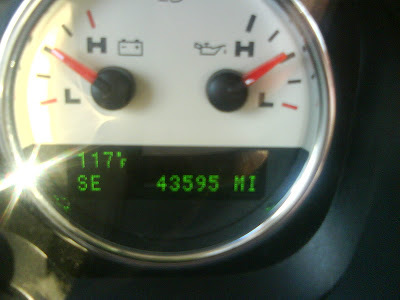 The one pic was inside my truck on one of the hottest days I can ever remember, 117 degrees! That's hot! Of course, inside a pickup truck sitting in the glaring midday sun is like an oven. But take a look at the other picture. I know it's sort of hard to see but can you make it out? Yep, you're right, it's a temperature reading of 9 degrees! That was last winter in January, when a friend and I were going duck hunting (and no, I'm not crazy) in the Trinity River bottom eight miles from Crockett. I snapped that picture in my truck about five o'clock in the morning, January 8, 2010. So, what's that, a temperature change of nearly 100 degrees? Pretty amazing, but those of us that live in Texas have become used to the weather ('used to' is a relative term- thank God for air conditioning). Everyone has heard the saying that if you don't like the Texas weather, just wait a little while and it will change. The last few days here in Crockett, the weather has simply been gorgeous. So, what do you do in East Texas when the summer heat dissipates and we finally start to see autumn on the horizon? Use your imagination, take a walk in the woods, go squirrel hunting, go to a high school football game, anything, just enjoy the out of doors.